After roaming around the entire night and morning (and eating our way through), we took a much-needed afternoon nap after checking-in to our hotel before coming out in search of some caffeine. Winstons Coffee was one of the options that appeared on Google Maps, and we were glad we came to this quaint little cafe near our hotel. The skinny Flat White (HK$35) was strong and very bitter, and hubby definitely felt more awake after drinking it. Both drinks came with a generous slice of delicious biscotti too! And water and WiFi are available for free. We woke up bright and early and took a morning stroll to bills (because so many people kept recommending it)! We reached here before 9am on this lovely Saturday, and it was not very crowded yet. Actually, my cousin had recommended scrambled eggs here, but we totally forgot about it and went on to have our priciest breakfast of the trip. It was such a hot afternoon and we were really melting while checking out the Keong Siak Carnival! Taking a breather, we popped into the nearby Selfish Gene Cafe for an icy escape! 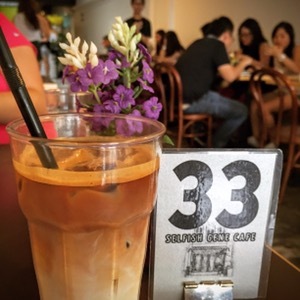 Cafes along this stretch of Craig Rd, and Tanjong Pagar area closes quite early during the day so although we had walked past this cafe a few times, we had not had any opportunity to try it out. Until today! Got ourselves a Iced Cafe Latte ($6 nett), and a Iced Chai Tea Latte ($6) to beat the heat. The coffee was strong and slightly acidic, while the tea was milky and abit on the sweet side, with a lovely hint of spices. And so we just sat here and chilled till we were ready to face the heat again! Water was free and by the bottle at each table.